The designer parody logo trend has definitely caught on with the cool kids. Even a few of the designers whose logos are being turned on their heads have embraced the movement. But it seems the folks at Chanel aren’t so keen on everyone’s interpretation of the trend. The Fashion Law reports that the French fashion house is suing What About Yves founder Jeanine Heller for using its interlocking C logo without permission in a few offerings. 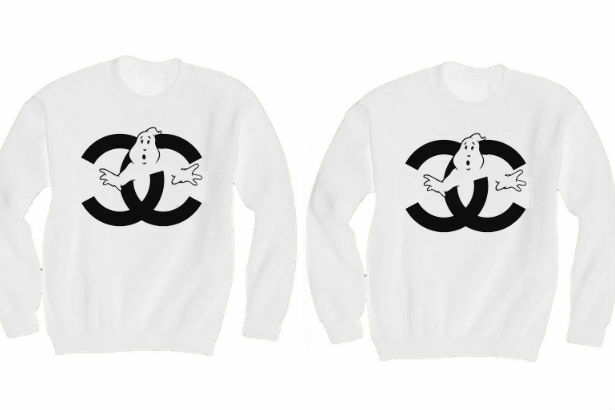 The issue is over the “Official Chanel X Ghostbusters Sweatshirt Design,” which features the Ghostbusters ghost peeking out from behind Chanel’s famous double Cs. Chanel’s people say the sweatshirts cause brand confusion, as the integrity of the Cs are intact, save for the addition of the Ghostbusters ghost. The suit also claims that Heller failed to modify the logo in a meaningful way, saying that she purposefully used the “clearly recognizable CC monogram mark [on] her own clothing precisely because of the iconic status of the mark, with knowledge of its association with Chanel, in order to call to mind Chanel.” If the parody was crystal clear, the use of the logo would be legal, but Chanel doesn’t see the parody in the piece at all. In addition to barring Heller and What About Yves from selling the sweatshirts, Chanel also wants the brand to hand over any products with the Chanel symbol as well as any profits made from the sale of the shirts in question. While the parody aspect of the shirt isn’t lost on us, we can see where Chanel is coming from. That sweatshirt could have easily been a result of a collaboration between Ghostbusters and Chanel (as bizarre as that would be). Chanel could have a really strong case here, although we’re not sure if the sweatshirt in question does as much damage to the Chanel brand as it is implying. It will be very interesting to see how this one unfolds.